My very slapdash on line research suggests this would be a Duncan Phyfe style sideboard. Seems logical. It has that neoclassical vibe that characterizes Duncan Phyfe. I’ve seen a few sideboards like this on craigslist, but either they are priced far out of my reach, or someone else snatches them up ahead of me. So when nnK sent me a link to this one, I acted on it promptly and arranged pick up for the same day. Luckily Mr. Q took one of his strong manly heavy lifting type friends (OK, really he might be his only manly heavy lifting type friend) to pick it up because they had to carry it down a narrow staircase! And since I have now had to move it a few times for very short distances, I appreciate that I did not have to attempt to get it down some stairs. It is very heavy and large. It has that one flaw on the upper right drawer where a hunk of veneer is ripped off. Otherwise, it was in quite good condition. 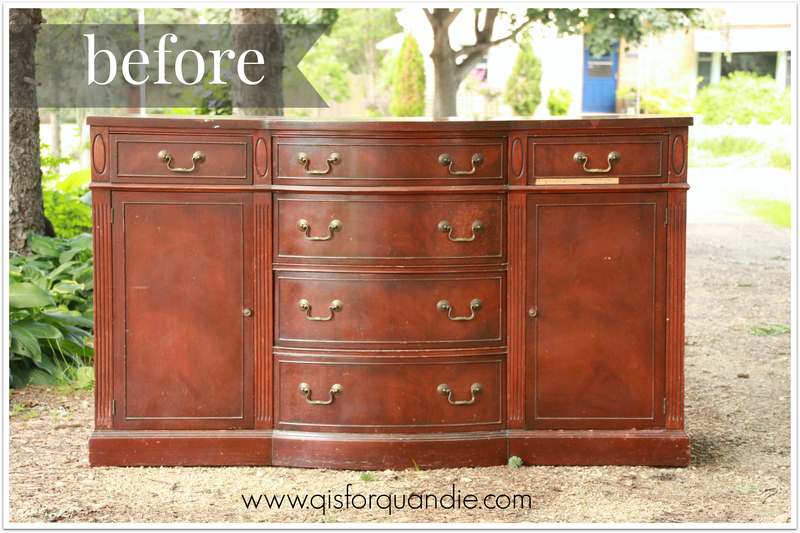 The major problem with this sideboard is that the original finish is hopelessly outdated. Am I right? So I gave it an Annie Sloan makeover. 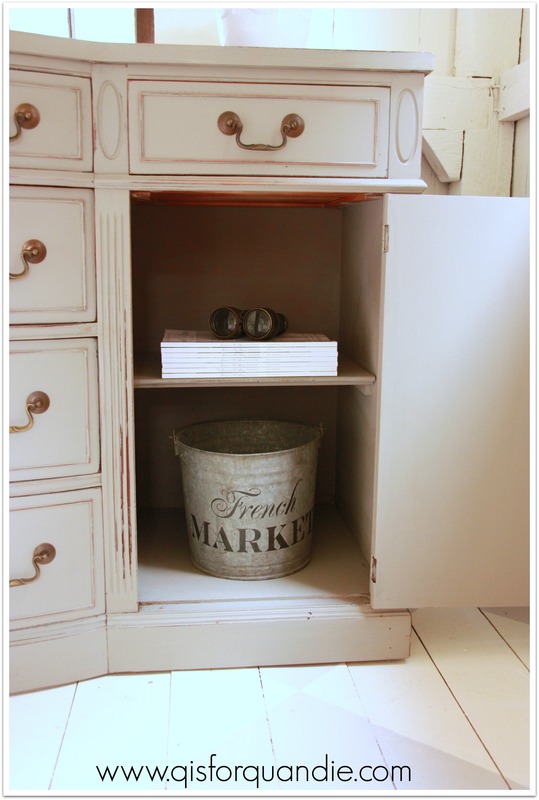 A simple paint job in French Linen. Such a gorgeous shade of grey. Nice and warm, not too dark, not too light. I even painted the insides of the two side cupboard areas. I sanded the top a bit to make sure it was smooth, and it feels like silk now. 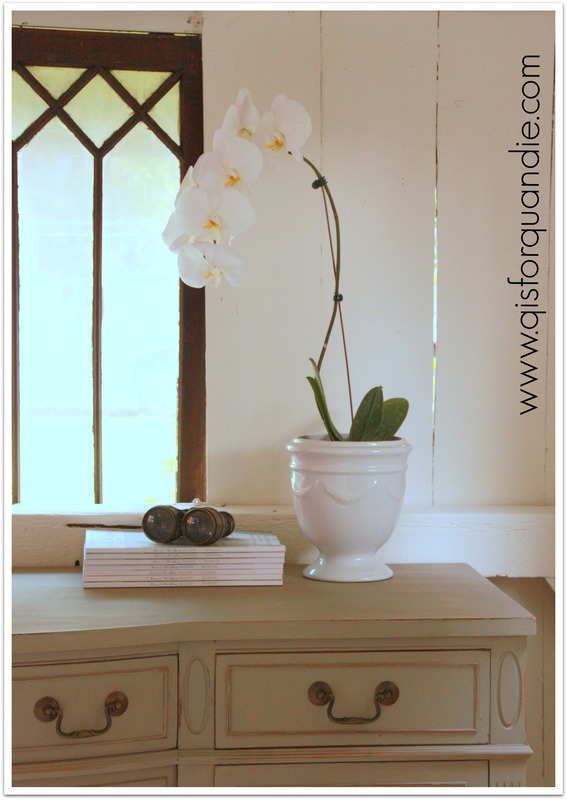 I staged this one quite simply with just an orchid in a white pot that I just purchased for 50 cents at a garage sale (the pot, not the orchid). The orchid is actually from Home Depot and cost $12.99. I added a stack of my Jeanne d’Arc magazines and the fabulous old binoculars that I purchased at a garage sale earlier this summer. Sometimes I struggle between finishing something in a way that I know will appeal to a broader audience and will find a buyer more easily and finishing something in a way that is creative and unique. I vacillated between those two choices with this one. I thought about putting a stencil on either side door. 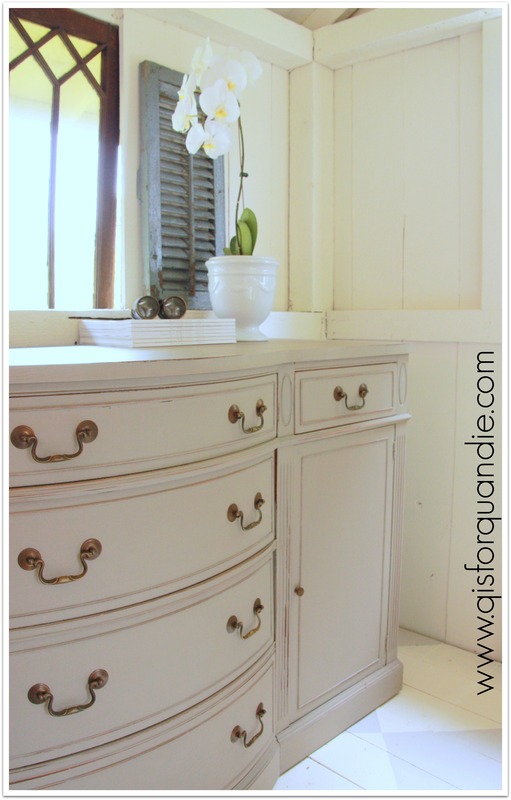 I thought about a two toned paint job, and I even considered stripes on the drawers. In the end, I decided that a simple paint job would help keep this piece marketable. I also felt like it had enough ornamentation on its own and didn’t need a fancy treatment. Likewise, I simply cleaned up the drawer pulls and put them back on. I always hesitate to spray paint hardware because I’m not convinced that it stands the test of time. I think it scratches too easily and doesn’t necessarily wear all that well. In a pinch, if the hardware is a horrible color, I’ll resort to oil rubbed bronze spray paint. 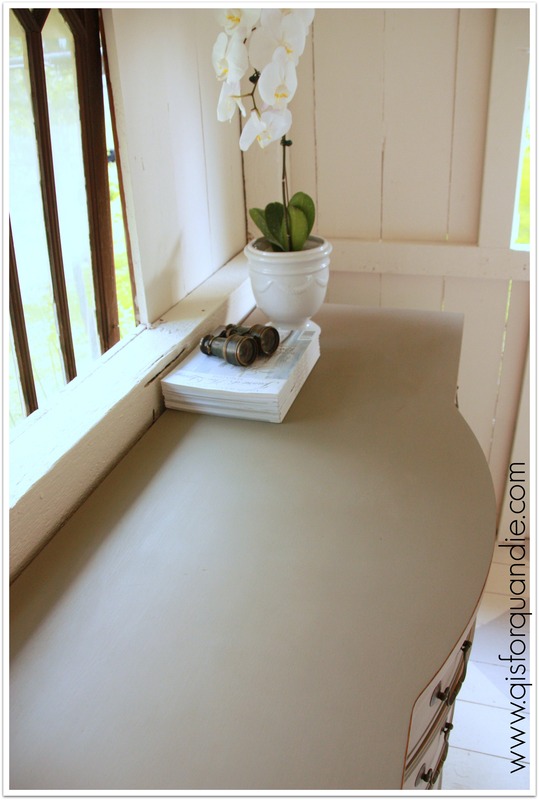 Also, I’ll paint hardware with chalk paint or milk paint if I intend for it to be chippy. I think this hardware works well as is though, so I left it alone. I’ll leave you with a final ‘after’ shot. 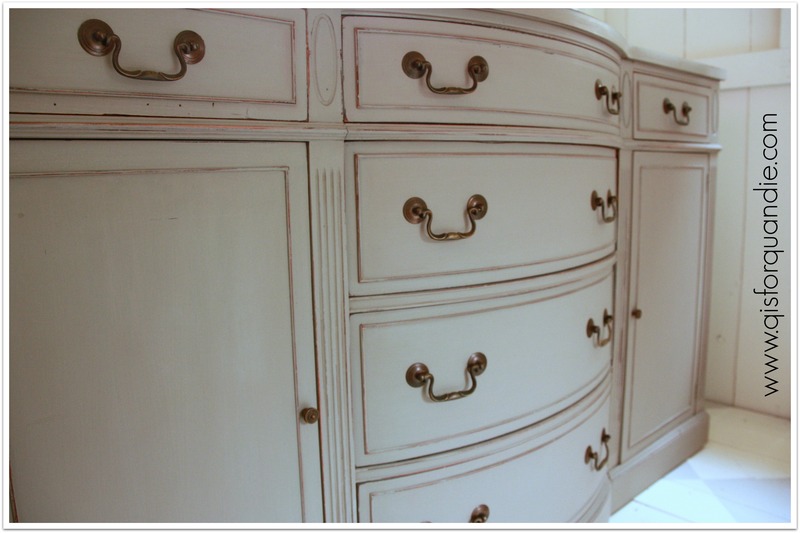 Anyone in the market for a Duncan Phyfe style sideboard in French Linen? LOVE it! Wonderful choice of paint and finish! I truly think this is your best yet. Love, love, love it!!! Beautiful! You made all the right choices, in my opinion. So Pretty-I totally understand the dilemma of painting to sell and painting for creativity and imagination. So often I just go with my heart and know that there will be someone else out there who will like my piece even if it is not white! I bought one similar for a client last fall all the while wanting to place in my house. The color you chose – is perfect and the hardware – good call. The lines of it just speak to me now if I could only figure out where to put it in my current home. I am, in fact, smitten! 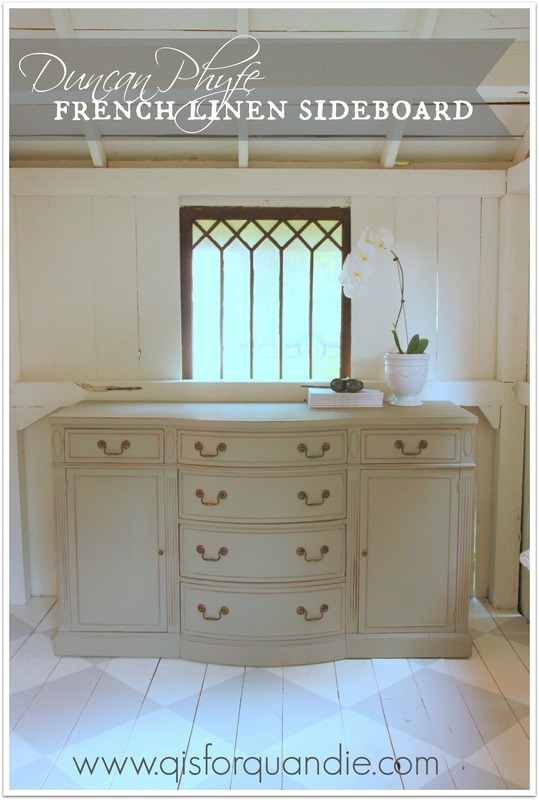 I do love this color from Annie Sloan. I had used it on another buffet and a few small things, and this buffet used up the rest of the can. Not to worry though, I went out and purchased another can yesterday! I love the finished product!! Beautiful color. Ha! That is why my blog name is so perfect for me! I’m always in a quandary about what to do. Thanks for your kind comment! This evening I am pondering the same question on a piece I’m working on. I’m going to go classic and not add the original decoupage design I had intended. I’m going to get this color, too, Linda. It is beautiful. Also, these original handles are so expensive if one orders the real deal, made in America, same wax cast molds, etc. We’d be crazy to replace them. They go the piece. This is one of those colors that can look very different depending upon the lighting. Well, I guess that really is true of most colors. But even if you go on pinterest and look at pieces painted in French Linen, there will be a big variance in how they look. Of course, the final top coat will change it up too. I did use a custom mix of dark and clear wax on this one too (and by custom I mean I took spoonful of dark and mixed it with a couple spoonfuls of clear). I love the color with a little dark wax to deepen it up. You’ll have to play around with it a bit to see what you like in person. As for the handles, I agree. I try to keep the originals when I can. They have so much more quality than the cheap new replacement knobs. They will easily last another 50 or 60 years, and I’m pretty sure you can’t say that about any of the knobs at Hobby Lobby.